Coordinated Universal Time (UTC), also referred to as Greenwich Mean Time (GMT), Universal Time (UT), or "Zulu" is an international time scale used in astronomical and aviation publications, weather products, and other documents. UTC uses 24-hour (military) time notation and is based on the local standard time on the 0° longitude meridian which runs through Greenwich, England. Midnight in Greenwich corresponds to 00:00 UTC, noon corresponds to 12:00 UTC, and so on. The following table provides a convenient way to convert between UTC and U.S. and Canadian time zones1. To illustrate how to convert UTC to local time, assume that an event will occur on Wednesday at 06:00 UTC and you want to convert this to PDT. Using the UTC conversion table, you can see that 06:00 UTC Wednesday translates to 11 p.m. PDT Tuesday. UTC is available via Internet, radio, telephone, and the Global Positioning System (GPS). UTC provided by the U.S. National Institute of Standards and Technology (NIST) and the U.S. Naval Observatory is available online at the Official U.S. Time page. Note that the accuracy of the displayed time may vary depending on the type and speed your Internet connection. Several radio stations worldwide transmit precise time signals2. However, only a few provide voice announcements indicating the current UTC. NIST continuously broadcasts time signals with voice announcements over shortwave radio from stations WWV in Fort Collins, Colorado and WWVH in Kauai, Hawaii. Both stations transmit on 2.500, 5.000, 10.000, and 15.000 MHz. WWV also operates on 20.000 MHz. Canada's Institute for National Measurement transmits time signals and voice announcements over radio station CHU in Ottawa, Ontario. CHU broadcasts continuously on 3.330, 7.850, and 14.670 MHz. Shortwave time signals travel near the speed of light. However, there is a tangible delay between the time they are transmitted and received at your location. This delay increases with your distance from the station. To complicate things further, the amount of the delay for a given location can vary. If you are several thousand miles from a shortwave time station, the amount of the delay and its variability can make the signals useless for critical timing applications. For most users in the U.S. the received accuracy of time signals from WWV and WWVH should be better than 1/100 of a second. WWV and WWVH are usually audible up to 2,000 miles away using relatively simple equipment. CHU provides a comparable quality signal in the northeastern U.S. and eastern Canada. 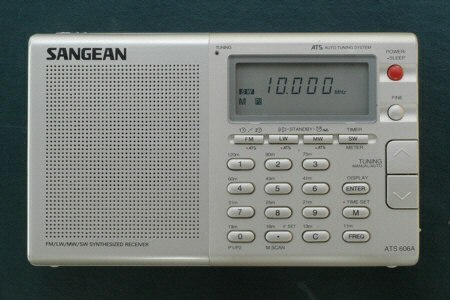 Portable shortwave receivers from Sangean, Sony, and other manufacturers offer the least expensive means to hear these stations. Unless you are located relatively close to a shortwave time station, you may need to use an external antenna. 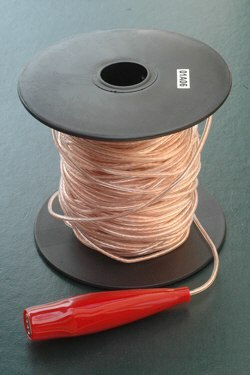 You can make a simple, but effective external antenna from a length of insulated wire that is 20 feet or longer. Strip the insulation off one end of the wire and connect it to the radio. Depending on the radio, the connection is made by clipping or wrapping the end of the antenna around the tip of the whip antenna, securing it using an antenna terminal screw, or inserting it into an antenna jack using the appropriate plug. At locations several hundred miles or more from the nearest shortwave time station, reception occurs by way of the ionosphere. The ionosphere, and the thus the reception quality for a given frequency, are affected by the time of day, current solar activity, and season. The best way to deal with changing ionospheric conditions is to check several time station frequencies to find the one with the best signal. If your receiver has programmable memories, use them to store several time station frequencies (in North America these would be 2.500, 3.330, 5.000, 7.850, 10.000, 14.670, 15.000, and 20.000 MHz). One problem that can hamper shortwave time signal reception is natural or manmade radio noise. The primary source of natural noise is lightning from thunderstorms. Such noise tends to increase as the frequency decreases. You may be able to minimize it by avoiding frequencies below 8 MHz. Electronic and electrical equipment such as computers, TV sets, and fluorescent lights can generate signals over a wide range of frequencies. Power lines, cable television cabling, and house wiring are other potential sources of radio interference. There are several ways to counter manmade interference. First, turn off unneeded electronic or electrical equipment. You can also physically separate your receiver and antenna from potential interference sources. An effective way to mitigate the manmade interference common within buildings is to use an appropriately placed outdoor antenna. You can also obtain the current UTC by telephone. NIST provides the audio from WWV at (303) 499-7111 and WWVH at (808) 335-4363. Time signals and voice announcements of the current UTC are also available from the U.S. Naval Observatory at (202) 762-1069 and (202) 762-1401. You can only connect to these numbers for a brief time before the call is terminated. Note that these are not toll-free numbers and callers outside the local calling area are charged at regular long-distance rates. The accuracy of time signals received by telephone varies with your distance from the time source and the type of connection. According to NIST, their telephone time announcements are normally delayed by less than 3/100 of a second when using land lines from within the continental United States and the delay variation is generally less than 1/1000 of a second. When using mobile phones, the delays are often more than 1/10 of a second due to the multiple access methods used to share cell channels. In rare instances when the telephone connection is via satellite, the time is delayed by 1/4 to 1/2 of a second. An overlooked source of UTC is the Global Positioning System. GPS offers reliable, worldwide coverage and the potential for extremely accurate timing. 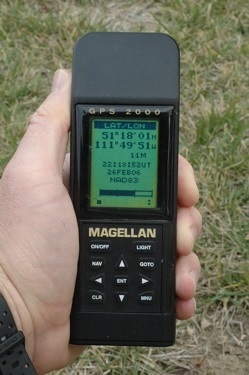 Some GPS receivers have a setup option to display the current UTC. Other units can be configured to display the current UTC by specifying a custom time zone with a UTC offset of 0 hours 00 minutes and disabling the automatic Daylight Saving Time correction. Most GPS receivers only use what is known as the "NMEA sentence" for timing and can have delays of several tenths of a second. There are also reports of GPS receivers experiencing intermittent errors in the displayed time amounting to entire seconds. When you use a GPS receiver to receive the current UTC, be sure to let it obtain a good lock so it can update its clock. Otherwise, the displayed time may be incorrect. For applications requiring accuracy within a second or so, you should verify the accuracy of your GPS' displayed UTC by comparing it against an accurate time standard. Reliable, precision timing is available from the Global Positioning System, but this requires a receiver that uses the GPS 1PPS signal. Such units provide the current UTC to an accuracy of 1/1000 of a second or better. 1In the U.S. and Canada, Standard Time (PST, MST, CST, and EST) is in effect from the last Sunday in October to the first Sunday in April. Daylight Saving Time (PDT, MDT, CDT, and EDT) is in effect from the first Sunday in April to the last Sunday in October. 2The following is a table of all time stations reported to be in operation. The information was obtained from various sources, most notably the 2006 World Radio and TV Handbook. Copyright © 2003-2018, Brian Webb. All rights reserved.